Since Faith shared her wonderful Rilakkuma collection with us, I thought I might show you a tiny part of my own Rilakkuma collection – two Rilakkuma strawberry squishies. In reality, my Rilakkuma collection is quite small. I have plenty of Rilakkuma letter sets and stickers but not much else. I spend too much money on other things to afford more Rilakkuma. But, these two little squishies are a special part of my collection. They were only available from San-X Gachapon machines in Japan last year and were a gift from my very sweet friend, Ellen. For those of you who don’t know, Ellen and I met up in Tokyo last year and had a lot of fun shopping for kawaii together. These came from some of our exploits. 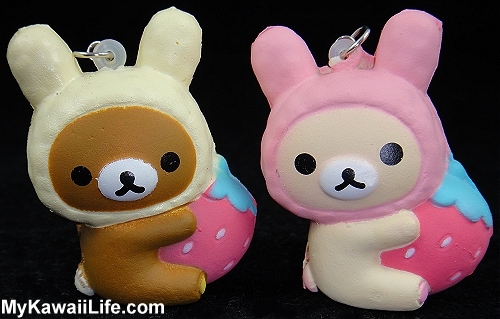 Both squishie bears have cute little bunny rabbit hoods and both are holding a strawberry. For some reason, Rilakkuma is a lot squishier than Korilakkuma. Both have an elastic band so I can attach them to a bag or hang them on a hook. I haven’t quite found the perfect spot for them yet but I’m very happy to have them in my collection. Thanks so much Ellen! Do you have any favourite Rilakkuma items in your collection? If so, I’d love to hear about them. Please leave a comment below or drop me an email through my contact page. And, please pin my Rilakkuma squishes to Pinterest. 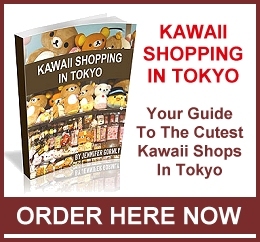 This entry was posted in San-X and tagged Kawaii, Korilakkuma, Rilakkuma, San-X, Squishie. Bookmark the permalink. 4 Responses to "Rilakkuma Squishies"
Those squishies are adorable, I hear they’re quite rare also. I love gashapon machines but was disappointed that I didn’t see more while I was in Japan. I don’t have too many Rilakkuma items in my collection but I absolutely love the Leo plush and the Christmas 2012 Kiiroitori plush. I think those two are my favourites. I love Gachapon machines too. I look for them everywhere in Japan. I was very excited last year when I found a Rilakkuma stickers machine. Your plush sound very cute. Those are very cute squishes! I really love all my collection but I have a few favorite series like my Happy Natural Time and Kichijoji’s Anniversary plushies!! Thanks Ariel. I like the Natural Time series too. I went to the Kichijoji store last year, but I didn’t buy a Rilakkuma.